Racquetball was invented by Joe Sobek in 1950. Sobek, an American professional tennis and squash player wanted to invent a new game that combined elements of squash, handball and paddleball that was quick and easy to learn. Originally called paddle rackets, the game’s rules were codified in 1952 and, through use of America’s 40,000 YMCA and JCC (Jewish Community Center) handball courts, the sport achieved rapid growth. In 1969 the International Racquetball Association (unfortunate acronym!) was founded and recognition by the US Olympic Committee followed. There are currently around six million racquetball players, as well as many more that play (confusingly) racketball, a less dynamic UK-invented variant of the sport. The object of racquetball is to win points by winning rallies, the exchanges of play between players where the ball must be hit against the front wall and returned with no more than one bounce. Matches are played as the best of two games, with a third, shorter tie-break game if the scores are level after two games. 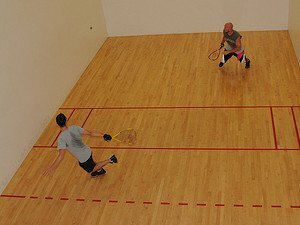 As with other such sports, racquetball can be played as singles (one versus one), doubles (two against two) or two competing against one, the latter being for informal games. The rules are essentially the same with the main difference being the service and so here we will look solely at the singles game. The only equipment really required is the ball and the racquets, although of course the court itself is needed too. The court is similar to a squash court, being fully enclosed and rectangular. It is both 20ft high and wide and 40ft in length with red lines to demarcate the service and reception zones. The ball is hard, bouncy, made of rubber and 2.25 inches (57mm) in diameter, significantly bigger than a regulation squash ball. The racquets are no longer than 22 inches and the only other equipment is the eye-guards that are mandatory in competitions and recommended when playing less formally, if you value your sight! The ball hits the floor more than once before you play your return. The ball skips or does not hit the front wall without bouncing when you play your shot. The ball goes into the viewing gallery, wall opening or out-of-bounds from your shot. The ball hits the other player but was clearly not going to hit the front wall. The ball hits you (i.e. the player who hit it originally). You switch racquet hand during the point. You touch the ball with any part of your body or clothes. You carry or throw the ball with the racquet (double hit). The player serving makes two (or one, under the one serve rule sometimes used at the top level) illegal serves. To win the game the player (or team in doubles) has to win two games. Games are won by reaching 15 points or, in the deciding third game if needed, 11 points. It is not necessary to win by two clear points. The player who is to serve first is decided by lots in the first game, alternates for the second game and goes to the person with the most cumulative points for the decider (if needed). To serve, the ball is bounced before being hit against the front wall after which it may hit one side wall before hitting the floor again. The ball cannot hit the back wall on the full and must not touch the ceiling. The ball must hit the front wall first or the point (i.e. both serves) is automatically lost and the other player serves. Once the ball is in play, that is, has passed the receiving line or bounced beyond the short line, the receiver must hit it against the front wall. Apart from on serve, the ball can be hit against any combination of walls and ceiling as long as it hits the front wall without bouncing. A “hinder” is when an obstruction is caused by one player being in the way of the ball or their opponent’s view. This is normally called as a let and the point is replayed, although in the case of a penalty hinder, where one player has been deprived the chance of a point-winning shot, they receive the point (or win back serve).